If you’ve been looking for a free clean eating meal plan, this is the place for you! Below is a whole week’s worth of clean eating recipes for breakfast, lunch, snack, and dinner. The definition of clean eating varies, but to me, clean eating means eating food that is as close to its natural state as possible. This means making most of your meals from scratch. Sound intimidating? It isn’t! It just takes a little practice, then it becomes second nature! However, I’m a mom of two kids and have an 8-5 job, so I don’t have time to make everything from scratch! If you are new to clean eating, start learning to read labels. If you don’t recognize most of the ingredients, put it back on the shelf. Food should be made with ingredients you recognize. 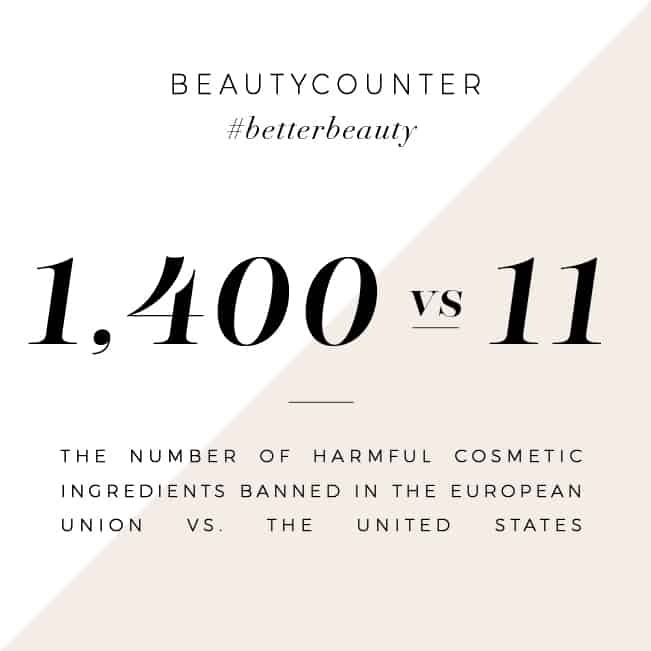 Another good rule of thumb is to not buy products that contain more than 5 ingredients. Here is more on what does clean eating mean. Is Clean Eating a Diet? I have been asked if you can lose weight while on a clean eating diet. And the answer is probably. One new study this year, showed that individuals who cut back on highly processed foods, sugar, and refined grains, who didn’t count calories or limit portion sizes, lost significant weight over the course of the study. This study suggests that quality is more important than counting calories, limiting carbs, or reducing fat intake. Following a clean eating diet will almost certainly increase the quality of the food you’re eating! I also believe that our bodies don’t have any idea what to do with preservatives or artificial ingredients. Our bodies weren’t created to process food with synthetic ingredients. I believe in eating clean because wholesome food is fuel to keep our bodies operating as efficiently and healthy as possible. When our bodies are well fed, we feel great! Additionally, when you fill your daily diet with wholesome fruits, veggies, whole grains, and lean meats, you naturally cut calories (without having to count them) and most people I have encountered will gravitate to a natural, healthy weight. Perhaps the most important rule of eating clean, for me, is that the food TASTES GOOD! A warm, home cooked meal fills my soul with happiness. I buy whole milk, real butter, and drink wine (in moderation). Low-calorie and reduced-fat makes me wonder what process a food has been through, or what artificial additives are in it to make something taste real. All of my clean eating meal plans are created with the thought that food should taste good! I want you to enjoy sitting down to a tasty, home cooked meal and feel like you’re fine dining, not deprived. 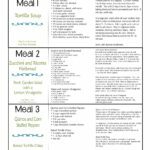 If I’ve convinced you to take a chance on clean eating, I hope you’ll enjoy the recipes on this free clean eating meal plan as much as I do. Here is a complete (and free) Clean Eating Menu Plan. 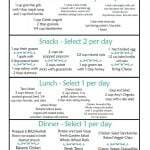 The menu plan is designed for an individual, and the dinner recipes are enough for 4 servings. 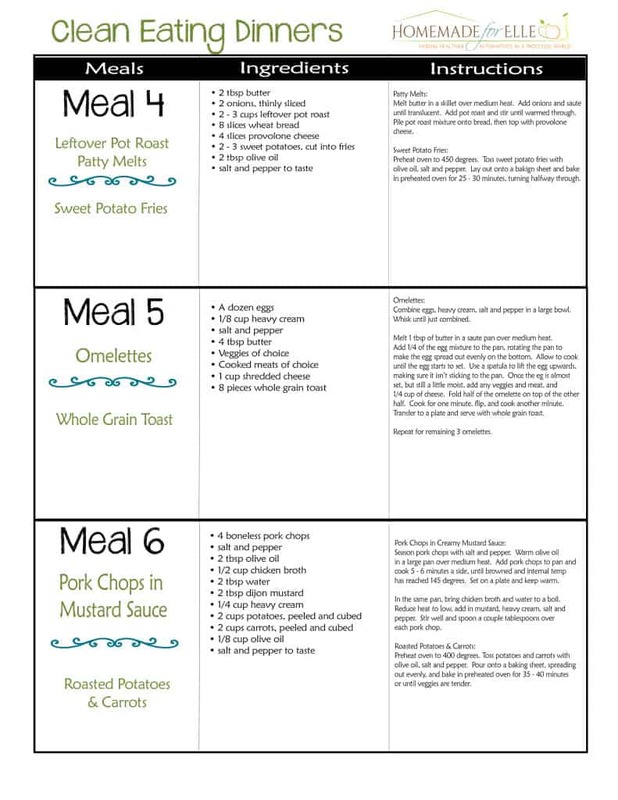 You can download and print the PDF version of this menu plan for free, here or click on any of the images below. Need a Clean Eating Dessert? Do you have any clean eating recipes you love? Please share your links or recipes in the comments below so we can all enjoy them! Thank you! This seems do able….even for me! Some foods I don’t know, but mostly recognizable. Trying to eat healthier! I am so glad you’re trying the plan! Please let me know how you like it! I’m having a problem getting week 2. Would this work for a diabetic diet? I have never looked into a diabetic diet, so I do not know if this would work. Maybe someone else with experience can weigh in? Finally a clean eating plan that does not include fish! 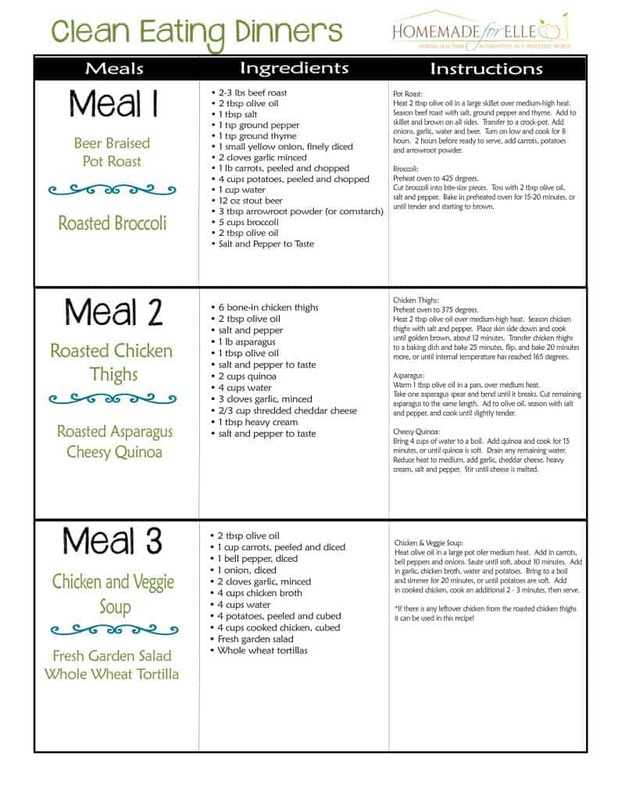 I’m new-ish to clean eating, and loving these menu plans, as I have no idea what I’m doing yet on my own! So thank you! 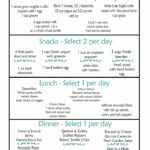 I have one question….I see that you plan the menus such that you can utilize certain ingredients for more than one meal, which I like, but wondering if it’s okay to mix and match the meals from different weeks? Or are they planned so that you are only getting a certain amount of calories? 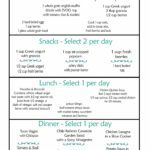 I love eggs and bacon, so week 1 breakfasts really appealed to me, and I’d love to continue with those plans but continue trying the other week’s lunch and dinner meals. Hope that question makes sense! Thank you! 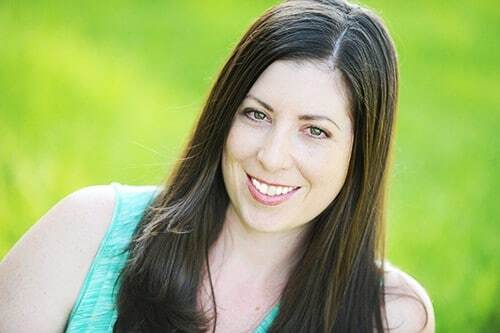 Hi Jennifer – absolutely mix them up! 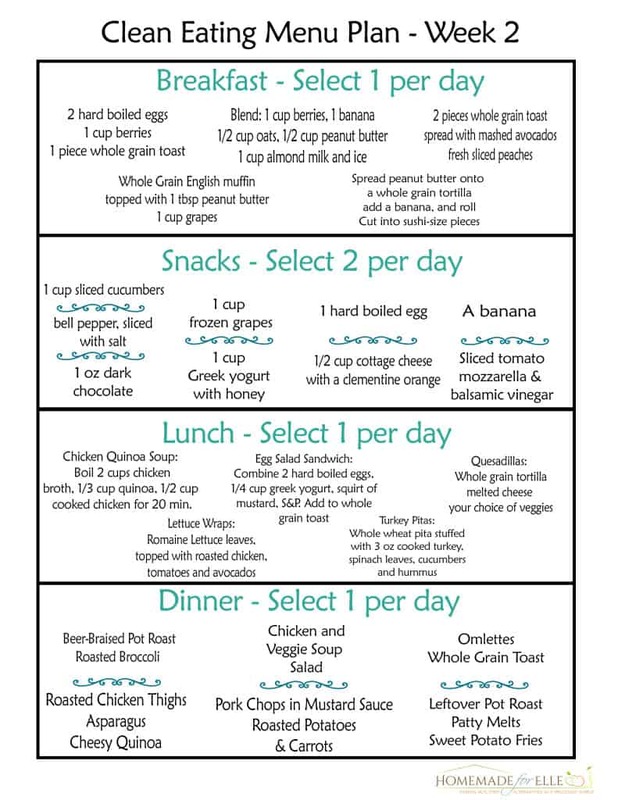 These meal plans are not created with any specific calorie count in mind. I do not generally count calories, but focus on listening to my body, eating when I am hungry, and getting a variety of fresh vegetables and fruits in any given day. Thanks! This is sooo helpful. Im starting week 1 this week. Where is week 2? Also, please post the week 3 recipes. Thanks again! These are great! When it comes to eating healthy and clean it can often be hard but having a plan really helps! Thank you SO much for these plans! My mom and I love the recipes and have been scheduling our meals together all morning. Love it! These meals all look fantastic! Do you aim for a specific calorie count when planning? If so, how many? I am happy to help – hope you enjoy them, Monica! When you make the dinners what are the serving size? This menu looks amazing! I’m trying to adjust mine and my fiancÃ©es eating habits! Do you have week 1 available still? And were other weeks ever added? Just found this on pinterest and I’d love to see what else you suggest. I am looking for healthier ways to feed my family. As a working mom sometimes just coming up with the ideas and planning is the hardest part. Thank you for doing the “thinking” work. I look forward to following this. 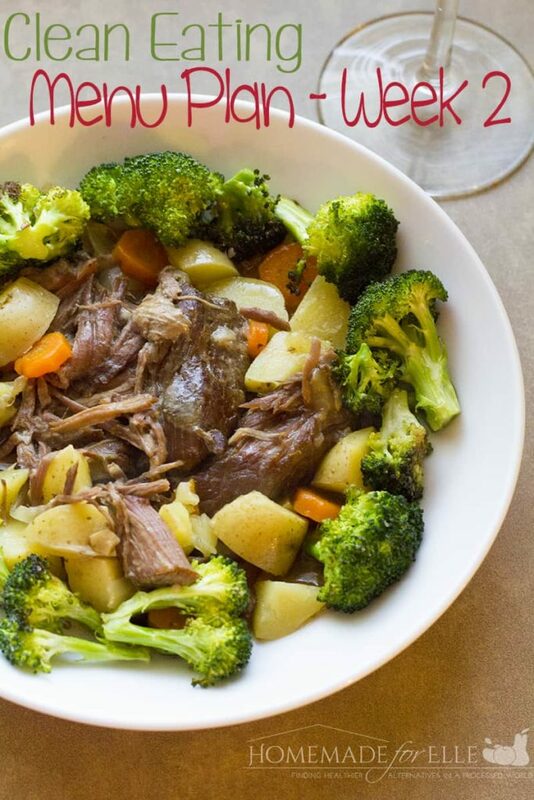 Omg that pot roast looks delicious. Thank you for making this meal plan! I have the WORST time sometimes coming up with meal plans so I love when it’s already made up for me. We do clean eating too. I like all of the recipes this week. My family would really enjoy that pork chop recipe.